Choon Poh (left): We are selling lifestyle. If we are selling houses, it would be hard to compete with local developers. Swee Yong (center): We are confident this project will be a success and it will serve as a direction for our future projects. Come Nov 17, MZEC Development Sdn Bhd will be launching its biggest project, Lestarry Heights in Mentakab, Pahang. Sitting on a 52-acre tract next to Jalan Temerloh-Mentakab, the RM300 million strata-titled development will comprise 193 two-storey terraced houses, 139 2½-storey terraced houses and 100 two-storey semi-detached houses. According to group managing director and founder Ang Swee Yong, the development is divided into five phases. Phase 2 — 49 units of 2-storey terraced houses and 32 semidees — will be open for sale at the Nov 17 launch. The soft launch of Phase 1 in March saw all 48 terraced houses and 24 semidees booked. About 70 purchasers have since signed the sales and purchase agreement. Swee Yong says the 2½-storey terraced houses will be open for sale in Phases 4 and 5, while Phases 1 to 3 will be a combination of 2-storey terraced houses and semidees. 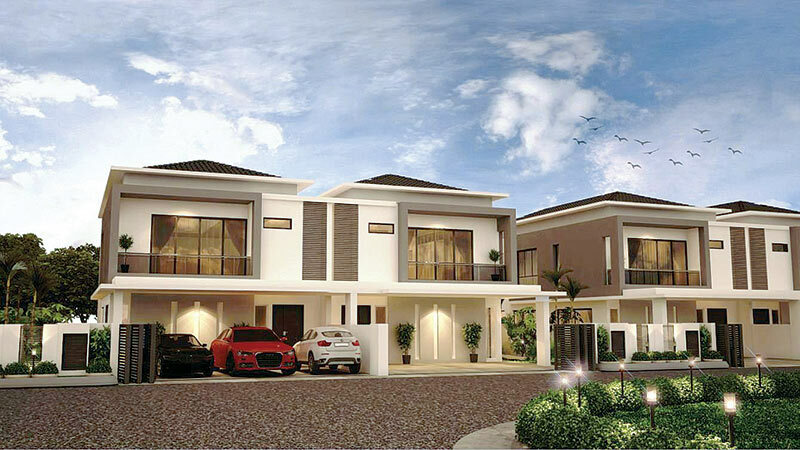 The built-up of the 2-storey terraced houses, priced from RM489,000, is 2,300 sq ft, while the semidees, measuring 3,000 sq ft, are price from RM698,000. The 2½-storey terraced house are 2,800 sq ft and the selling price is around RM600,000. The development has a 25,000 sq ft clubhouse on a two-acre tract and a five-acre central park. “To show our commitment and make an impression, we built the clubhouse before we did any launches. It was completed in March this year and every month, we host activities there. “We want to foster close ties with the local community. Our intention is not just to make money but to give back to society as well,” says Swee Yong. As Lestarry Heights is a strata development, the clubhouse will be for the residents’ exclusive use. Facilities include a gymnasium, multipurpose hall, swimming pools, badminton courts and a basketball court. The target market is first-time homebuyers and upgraders. According to Swee Yong, a survey of the buyers showed that more than 50% are upgraders. 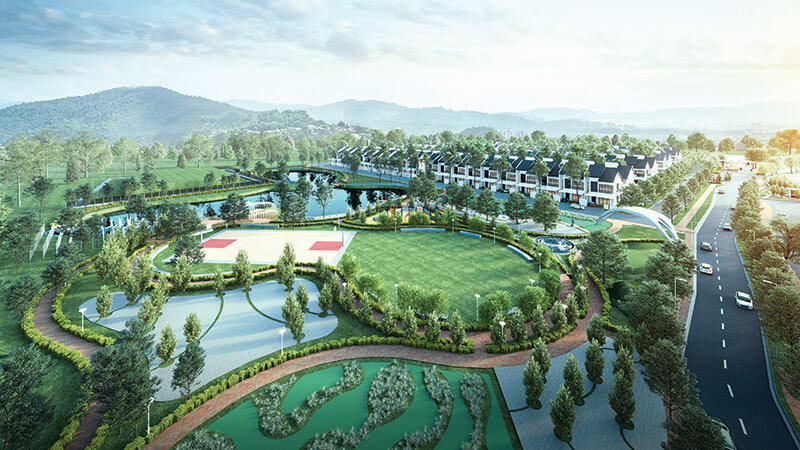 The developer’s business model focuses on bringing housing developments that include lifestyle facilities to second-tier cities such as Batu Pahat. “In the Klang Valley, Johor and Penang, this kind of gated-and-guarded development with full facilities is common, but not in second-tier cities. We want to duplicate this concept in second-tier cities,” says director Ang Choon Poh. The fact that Phase 1 was fully booked at the soft launch shows there is demand he says. “We actually planned to launch Phase 2 later. But since the response was so good, we decided to open it now. We are cautious as the property market is slow now but we have achieved 50% confirmed sales. So we are confident this project will be a success and it will serve as a direction for our future projects,” says Swee Yong. Other than lifestyle facilities, the developer is emphasising the quality of the houses. Director Lee Chuen Haur says that Swee Yong, who had unfortunate experiences in the past as a homebuyer, took a couple of years to plan Lestarry Heights, emphasising the quality and the handover time. “As businessmen, we think about supplying quality because buying a property is not something a person does repeatedly. For many, it could be just once in a lifetime,” he says. Currently, apart from Lestarry Heights, the developer has a project in Sungai Soi, Kuantan, called Taman Sg Soi Jaya 2, comprising 43 two-storey link houses and 43 units of 1½-storey link houses, which it categorises these as affordable homes with selling prices below RM500,000. “Affordable means regular projects without any lifestyle elements. It is our own private initiative,” Swee Yong says. The development has achieved a 50% take-up rate to date and construction has commenced. Apart from lifestyle boutique developments, MZEC offers affordable houses, at a ratio of 70:30, he says. He revelas that there is a 60-acre piece of family land in Batu Pahat and he plans to duplicate Lestarry Heights’ model to excite the local market. “In business, we cannot be similar to our competitors. We want to create something new that will excite the local community. “We will conduct some studies and see what type of product is more relevant for the local market or if we want to include a special theme. For example, if there is a river there, we want to take advantage of it and use it for our landscape design,” he says. Another upcoming project will be in Banting, Selangor, comprising 120 residential units on a 12-acre parcel. The gross development value is about RM40 million. For now, the developer’s focus will be on Lestarry Heights but it is on the lookout for joint-venture opportunities. “Once this project [Lestarry Heights] is running smoothly and there is an opportunity, we may look into a joint venture or buying land,” says Swee Yong. If there is an opportunity, the company is interested in doing a high-rise development in Kuala Lumpur in the future. MZEC Development is part of the MZEC Group of Companies. Swee Yong founded the company in 2003, which specialises in supplying construction timber, plywood and chemical products to the construction industry. “We also have a concrete engineering business. So, we are familiar with construction and help to solve problems related to concrete in other projects. Our buyers don’t need to worry about concrete failure because this is our speciality,” he says. “We are very serious about quality as our reputation is on the line. This is why our existing buyers would recommend our developments to their friends,” says Lee. In 2010, as the Ang family has land in Banting, Swee Yong decided to diversify into property development. 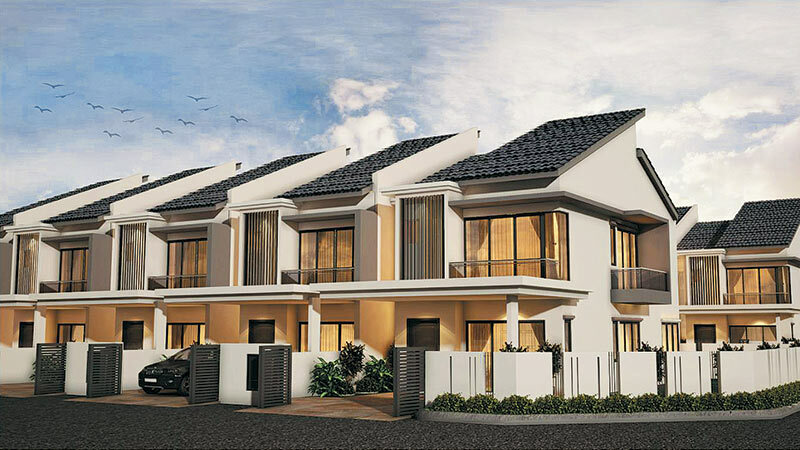 The developer’s maiden development is Taman Baiduri, Banting, which comprises terraced houses. To date, it has completed close to RM100 million GDV worth of projects. “We are familiar with construction and building materials, and property development is related to our businesses. Hence, we decided to diversify. When the property market slows down and other developers worry about their business, we can keep going because we have other businesses and they can cushion the risks,” says Swee Yong. The group’s main income comes from plywood trading. In terms of turnover, property development is the second biggest contributor. “In the short term, we want to be known as a boutique developer. We like to take things slow and steady and, as Lee said earlier, we are particular about the quality. Whatever we promise, we must deliver,” Swee Yong sums up.